As noted previously, I'm actually not on the road anymore in Hawaii, but since I had the idea for this post while I was there, I'm still calling it a dispatch. And actually, the first two pictures are aren't from my recent trip either, but they illustrate very nicely the idea of a kipuka. 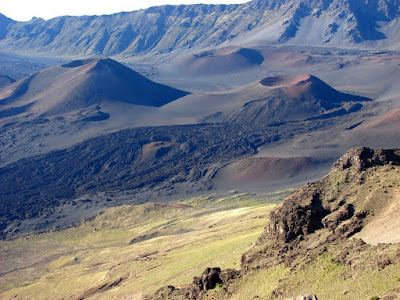 The picture above shows a number of cinder cones in the high summit valley of Haleakala on the island of Maui. 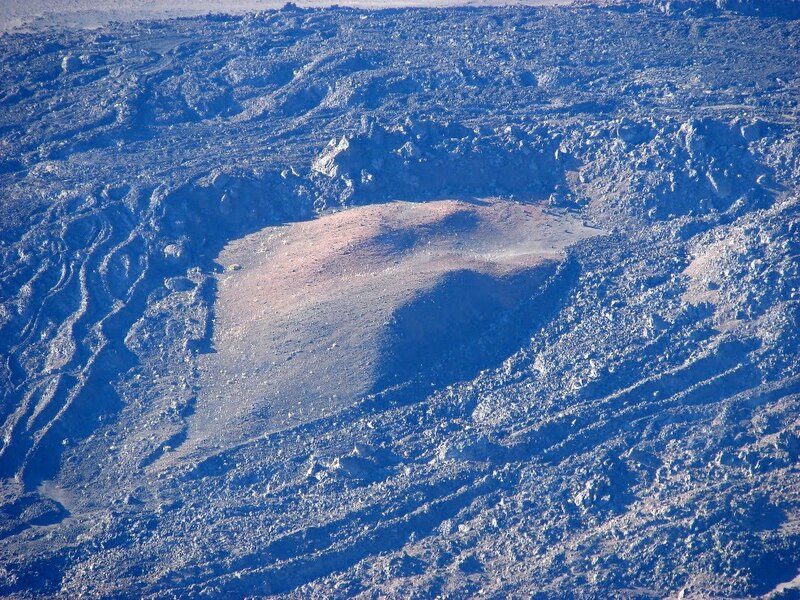 If you look closely at the rough, blocky a'a flow below the closest cone, you can see an odd smooth area that I have enlarged below. 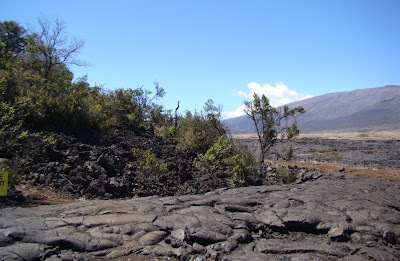 The lava flowed around the small area of older rock, and that is what a kipuka is: an area of land that is completely surrounded by a lava flow. 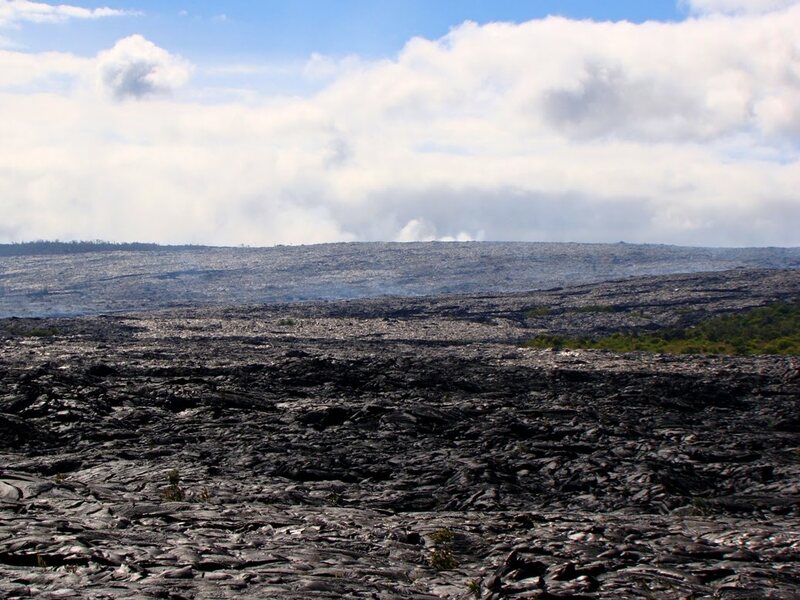 If the land surface pictured above had not been at 8,000 or 9,000 feet, one could imagine that a forest growing within the kipuka might have survived the volcanic eruption and lava flow, and in the aftermath would be isolated from any surrounding forest tracts. 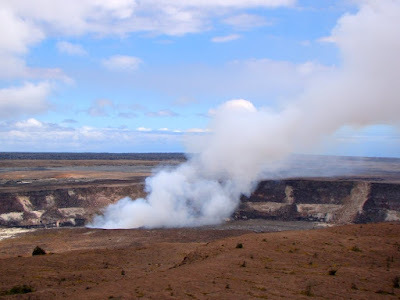 That's what happened at Hawaiian Volcanoes National Park on the Big Island of Hawai'i. About 600 years ago, a lava flow from Mauna Loa overwhelmed the forest of mature Koa and Ohi'a trees, but left a fragment of the woodland sitting on lavas 8,600 years old unscathed. 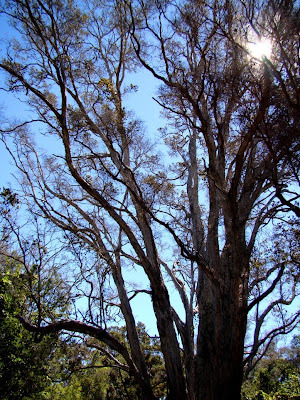 The kipuka was often mantled with ash from the eruptions of nearby Kilauea, but the forest persisted. 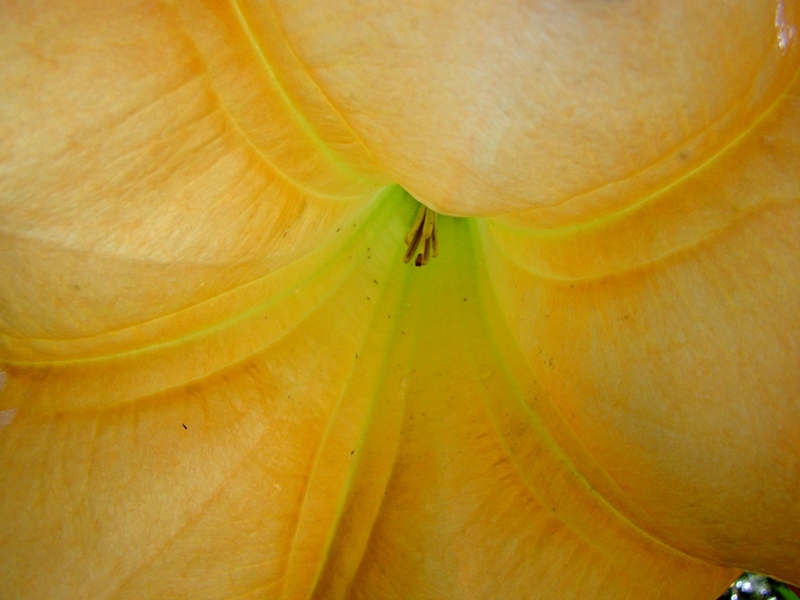 Today, the kipuka contains one of the most diverse collections of native flora on the Big Island. 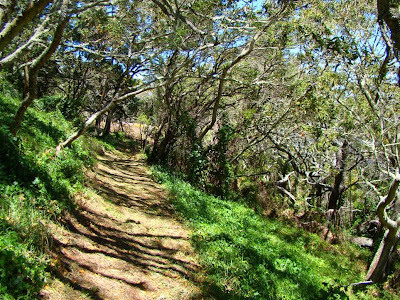 A beautiful and serene one-mile trail winds through the unique preserve. The place is called Kipukapuaulu, or the Bird Kipuka. A Hawaiian elder calls it a "Residence of Godly Existences". It wouldn't be quite correct to describe Kipukapuaulu as an untouched pristine environment. At one time it was, but cattle were released on the islands in the late 1700's, and pigs and goats moved in as well. 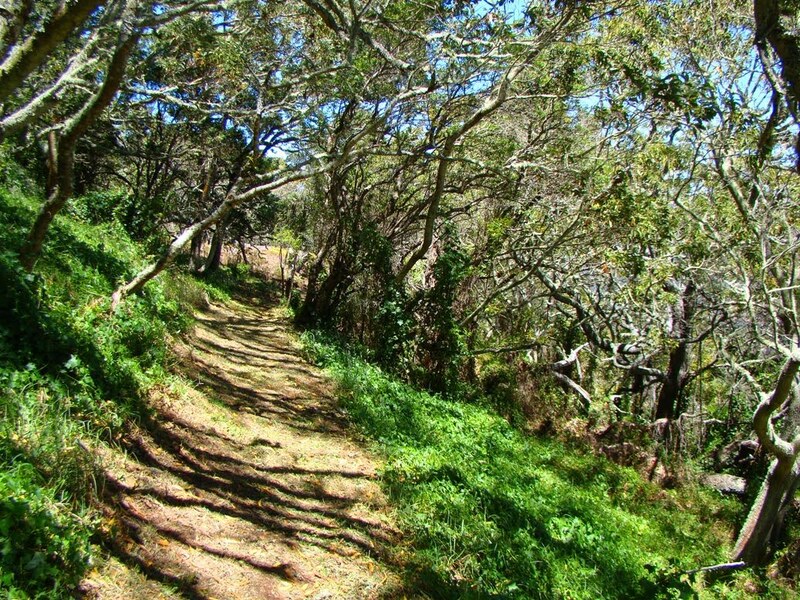 The natural flora of the kipuka had no defenses against the aggressive grazers, and by the early 1900's, the kipuka was a park-like grassland shaded by the "grandfather trees", the older Koa and Ohi'a trees that the cattle couldn't reach. A park sounds pleasant enough, but the trees couldn't reproduce (the saplings were quickly eaten), and the diverse understory of shrubs and perennials had been replaced by alien grasses. The potential value of the kipuka as a possible preserve of rare native species was recognized surprisingly early by botanists, who arranged for the removal of cattle in 1928, and the removal of goats and pigs in 1968 (a fence surrounds the kipuka). Volunteers have removed some of the worst of the invasive weeds and grasses, and seeds lying dormant in the soils started sprouting. In other cases, native species were planted. After a few decades, the kipuka is returning to a condition that is comparable to its natural state. One of the strangest stories I've run across regarding Kipukapuaulu is that of the small tree called hau kuahiwi (Hibiscadelphus giffardianus). A botanist named Joseph Rock (shouldn't he have been a geologist?) discovered the sole remaining specimen of the plant on planet Earth in Kipukapuaulu in 1911 (the cows had not quite finished it off). He managed to collect enough seeds to get a few sprouts going, and so the plant survives in captivity, so to speak. A couple have been planted in the kipuka that was its ancestral home. The kipuka came under protection sort of in the nick of time. 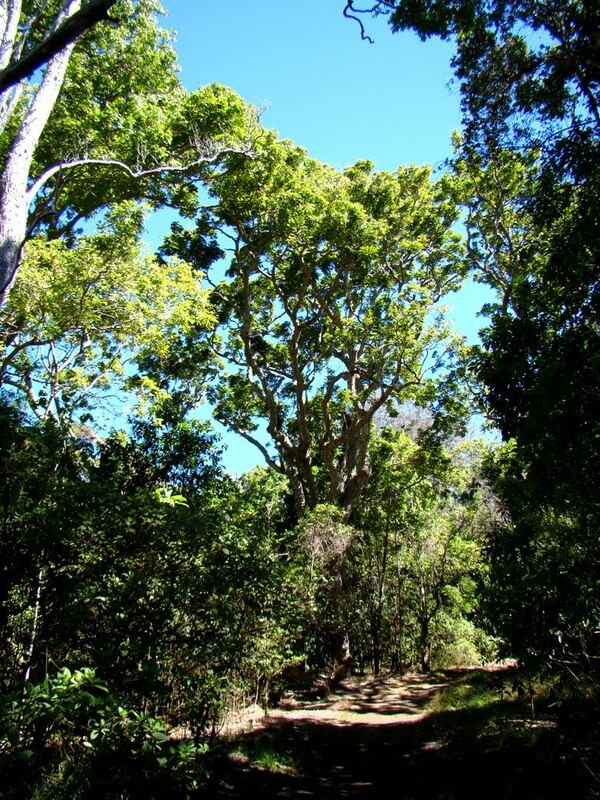 Some of the "grandfather trees" that shade the preserve have been dying off in recent years (like the Ohi'a tree in the picture above). 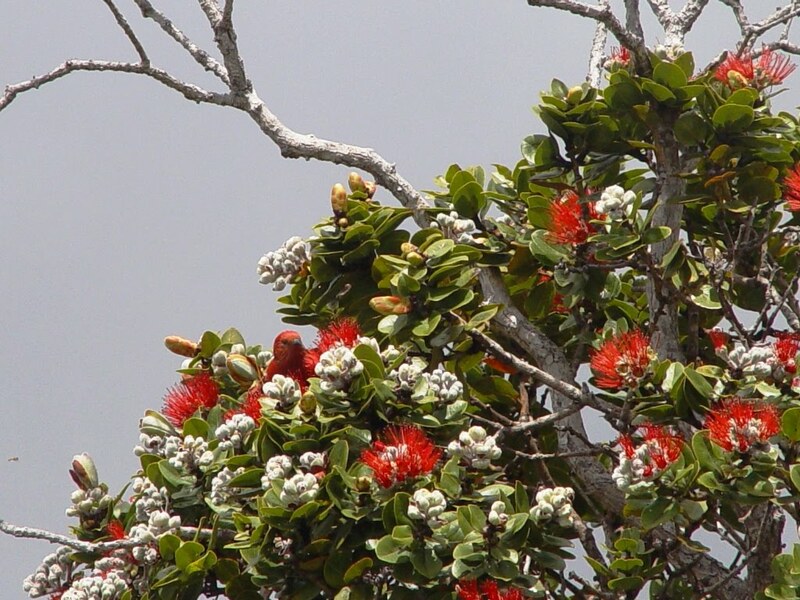 Ohi'a trees (Metrosideros polymorpha) are one of the most extraordinary of the native trees in Hawai'i. The thrive in a greater range of environments than pretty much any tree on the planet, being found in places as diverse as new lava flows, desert slopes, and alpine ridges. They can appear as small shrubs or as huge rainforest canopy trees a hundred feet tall. The trees in the kipuka may be dying of old age, or because of a series of droughts in recent years, but new Ohi'a trees will be able to grow to replace them now. A few steps off the trail is an intriguing opening in the ground. It is a lava tube, part of the plumbing system of basaltic lava flows. Because it has existed for more than 8,000 years, it is one of relatively few that has some species of cave-dwelling organisms (including the first one discovered in Hawaii). 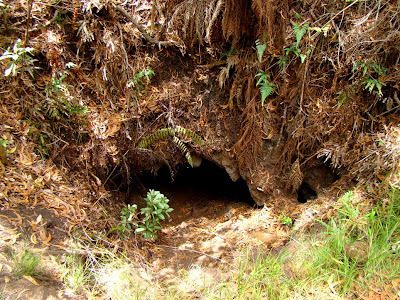 Like the rest of the kipuka, the cave was heavily impacted (in this case by graffiti artists, vandalism and trash), but visitors are now encouraged to leave the cave alone. The preponderance of native plant species attracts the native bird species to the kipuka, and they can commonly be seen flitting about in the forest canopy. They are frustratingly difficult to photograph, mind you, and I am actually cheating here by showing a picture of an Apanane from a 2004 visit. 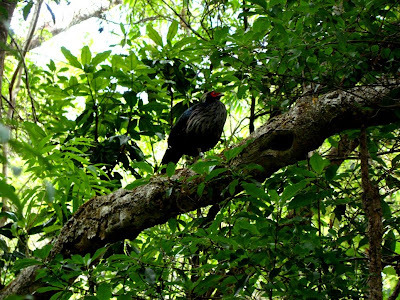 The bird below is often seen in Kipukapuaulu, but it is not actually a native. It is a Kalij Pheasant, a 1962 import from southern Asia. There is some concern about the effects they might be having on the vegetation. You can gauge the level of interest by biologists by the fact that this one had a leg tag. There is a hen hidden in the leaves to the right. Kipukapuaulu is a fascinating and peaceful place to visit. 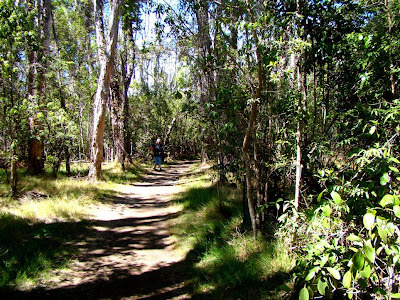 The nature trail is well-marked, and much of my information in this post is drawn from the Kipukapuaulu Trail Guide, written by Tim Tunison and Andrea Kaawaloa-Okita, and published by the Hawai'i Natural History Association. Additional information was gleaned from the book Hawai'is Native Plants by Dr. Bruce Bohm. 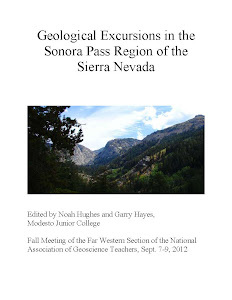 The Far Western Section of the National Association of Geoscience Teachers would like to extend an invitation to all geologists, teachers, and students who are interested in the geology of California. We are having our Fall Conference at CSU Fresno on October 8-10, and will be offering a wide ranging roster of field trips to Sequoia/Kings Canyon National Park, Yosemite National Park, the Sierra Nevada foothills, Carrizo Plains National Monument, the Diablo Range of the Coast Ranges, and a look at the brand new Madera Fossil Discovery Center and the excavations of Ice Age faunas at the Fairmead Landfill. We will also have a vast array of California and Nevada geology field guides and other resources available for sale. You do not need to be a member of the NAGT to participate. Special discounts are offered to students, and costs are low for this kind of opportunity. Information and registration forms can be accessed on the Far Western Section website. For questions and more information, please contact conference coordinator Paul Troop. Cross-posted from Teaching the Earth Sciences. I'm home, but since I had the idea of this blogpost while I was on the road, it still counts as a dispatch. I've been in Hawaii, and I used several posts to describe the problems of non-native species on the islands, especially the birds. I complained that I didn't get any good photos this time of some of the native species, but that wasn't entirely true. We stayed in Kailua on Oahu right next to Hamakua Marsh, which is a critical habitat for four endangered Hawaiian native birds. 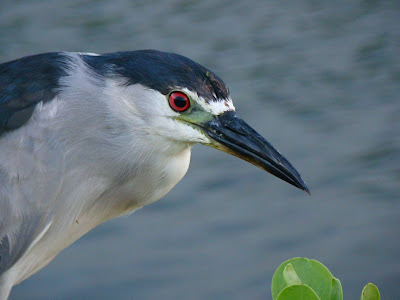 Our red-eyed friend above is a Black-crowned Night Heron, which arrived in Hawaii in prehistoric times, but is little changed from its continental relatives. 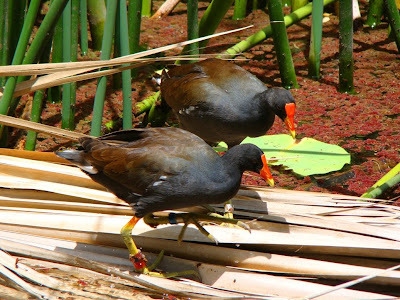 Also found in the Hamakua Marsh (and at Waimea Canyon) are the Common Moorhens, or 'Alae'ula (Gallinula chloropus sandvicensis). Unlike their name, they are not common at all, as there are only 1,000 or so left on the islands (the presence of tags on their legs is a good clue that they are endangered). They have problems with habitat loss and predation. 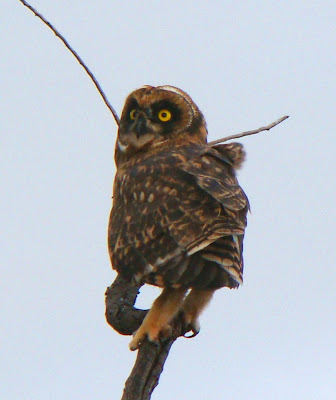 The same day I saw the 'Elepaio, I was thrilled to catch a Hawaiian Short-Eared Owl or Pueo (Asio flammeus sandwichensis) roosting on a stump at the lower end of Waimea Canyon. I try to imagine the journey that its ancestor had to get to the islands; I don't think of owls as flying over thousands of miles of ocean, but it only had to happen once in the last 5 million years. 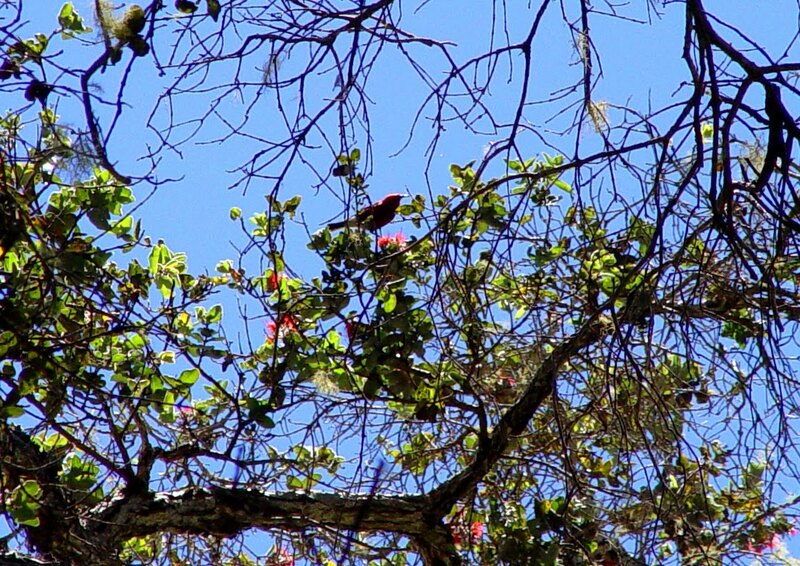 I've had the least luck catching glimpses of the Honeycreepers and related species. On a foggy day at the Na Pali overlook on Kaua'i, I played "Where's Waldo Apapane?" among the beautiful Ohia trees. 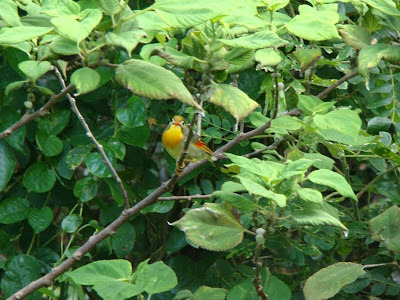 The Apapane (Himatione sanquine) is one of the few native finch/honeycreepers that is not in serious danger of extinction. 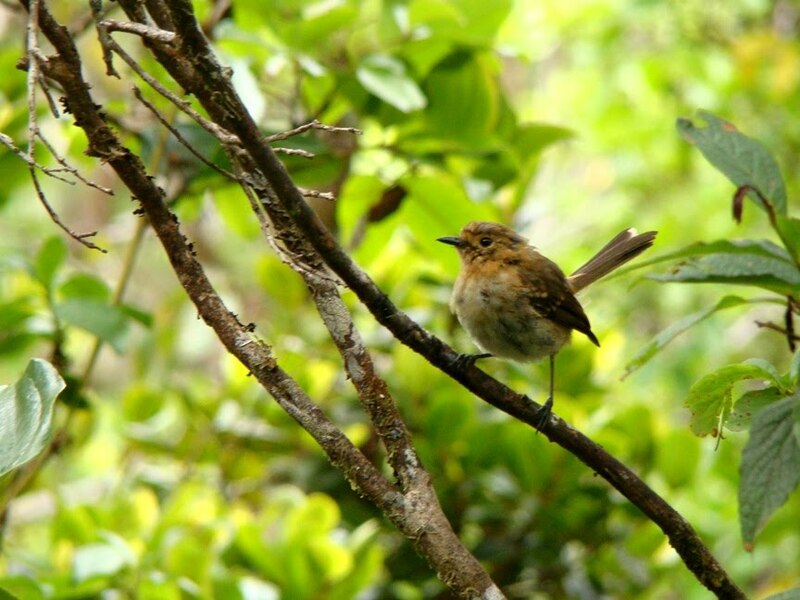 The original finch that colonized the islands diverged into around four dozen species, but most are already extinct, and many others are on the verge of the abyss. 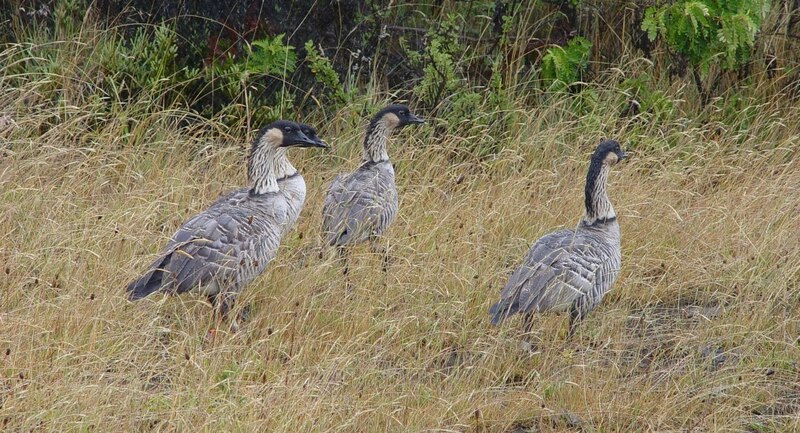 A few million years ago, a Canada Goose (or flock of geese) got misdirected to Hawai'i, and decided they liked the environment. 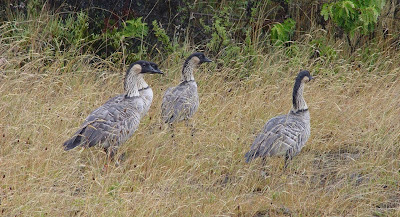 They evolved into the Nene (Branta sandvicensis), becoming less adapted to water (losing some of the webbing of their feet), and preferring life in fields and on lava flows. The arrival of cats and mongooses on the islands almost spelled their doom and they were nearly extinct by 1951. An intense captive breeding program stabilized their population, and their reintroduction to Kaua'i (where there are no mongooses) has been successful. I saw the group below on the slopes of Haleakala on the island of Maui. Dang if these trips are never long enough! Hawaii is such a fascinating geological wonderland, but lest you think I ignored the beaches, I can say that in the tradition of the true tourist, I did in fact visit some beaches. I, uh, didn't snorkel, or surf, or boogie-board, and I tended to be picky about the particulars. Not the sand and sun, mind you, but what backed up the beach. The nice ones have cliffs. The Big Island of Hawai'i is not actually noted for having lots of cliffs, being that many of the volcanoes are still active, and being shields, they tend not to have overly steep slopes. 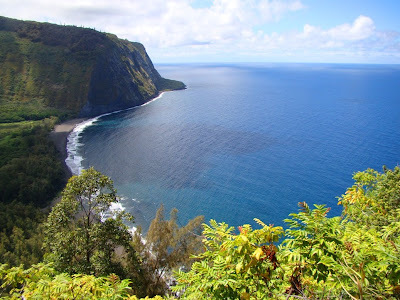 But on the northeast coast there was a massive landslide hundreds of thousands of years ago that formed some of the most scenic coastal cliffs on the islands: Waipo and Pololu. Waipo Valley, seen above, is a thousand foot deep valley that ends at a black sand beach. It was once as much as a thousand feet deeper, but the island has been subsiding, and the valley has filled with alluvium. There used to be a village on the flats, but most of the buildings were destroyed by tsunamis in 1946 and 1960. 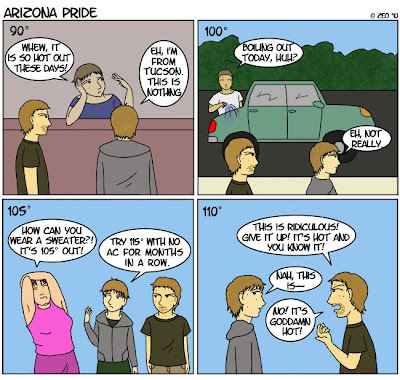 A few people live very simply in the valley today. The drive down the road is for 4WD vehicles only. Towards the south end of the island, there is a black sand beach at Punalu'u that is a favorite resting area for sea turtles. 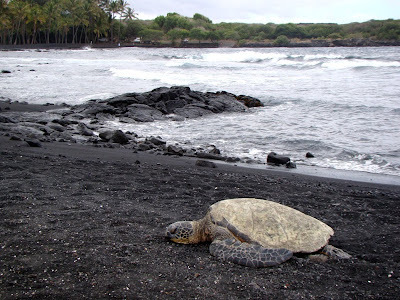 Most of the rock on the island is basalt or basaltic glass, hence the occasional black sand. If there are coral reefs and coral-munching parrotfish, the beach sands will be white or tan colored, being composed of small fragments of the coral. The one kind of beach that doesn't occur is a quartz sand beach, as there is no quartz to be found anywhere on the islands, except as an occasional agate filling vugs in basalt flows. In a few instances, olivine is the dominant mineral on the beach, leading to a green sand beach! 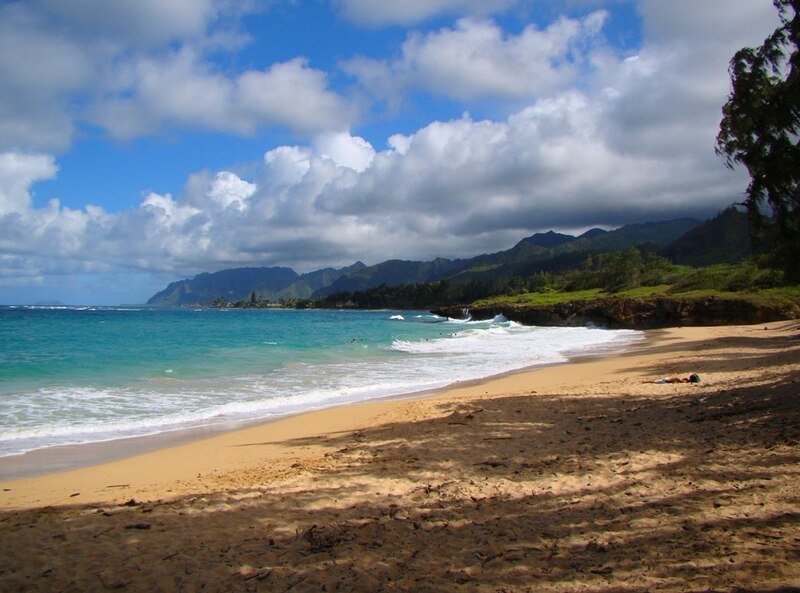 Back on Oahu, there are some beaches that are just almost stereotypically beautiful, especially on the north and east shores, away from Waikiki. The beach in this picture is Lai'e, which is on the close to the northern tip of the island, near the Polynesian Cultural Center. Your impression is correct: no crowds, easy access, and nice shade trees. The beach is also called Pounders Beach, probably for what happens if you surf too far to the right side of the beach. Some of the beach sand has been lithified (hardened), and is being undercut by the waves into the striking overhanging cliff (one heck of a wave-cut notch). Dispatches from the Road: An Invasive Species? That's a Bunch of Bulbul! Who are you calling "invasive"? 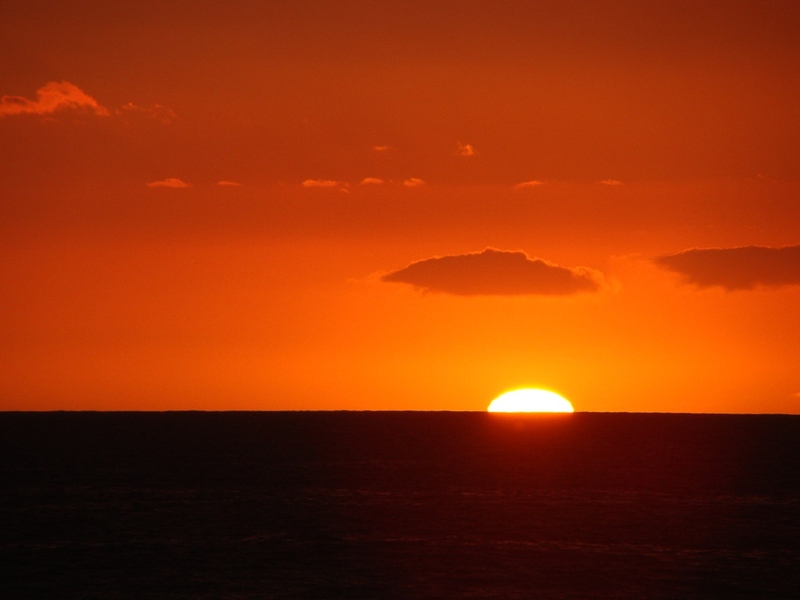 The Hawaiian Islands are a crucible of natural selection, and a laboratory for studying evolution. The islands spawned dozens and dozens of new species from the few original species that found their way to the isolated volcanic landscape over several million years (a successful new arrival on average every 20,000 years; these things don't happen fast), and in the present day, we are observing intense competition between native species and introduced species that piggy-backed with humans, in the first Polynesian wave more than a thousand years ago, and in the current wave of the last two hundred years. Unfortunately, it is the native species that tend to lose out. The natives have been battered by introduced diseases, especially mosquito-borne bird malaria, predation by mongooses, cats, dogs, and rats, and by severe loss of habitat due to grazing, agriculture and urbanization. Most of the native species survive in high-altitude forests above 4,000 feet (too cold for mosquitos), and they can be difficult to see. I know, because I try to photograph them on every trip and for the most part I am stunningly unsuccessful. Especially this last week. Still, the invaders are a beautiful and diverse lot, and it's not their fault for being here; I do enjoy getting close-ups of them when I can. I "collected" some new species this week, in the digital sense. 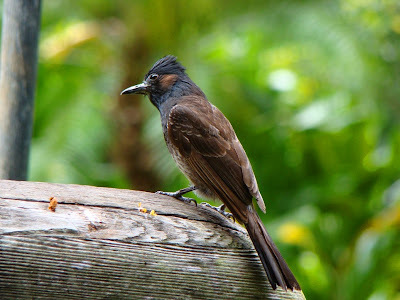 The first two photos are of some Red-Vented Bulbuls (Pycnonotus cafer), an Asian species that arrived on the islands in the 1950's, probably as escaped pets. 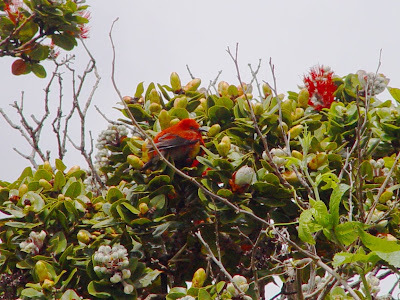 They were cute and friendly with us in Waimea Canyon on Oahu, but they love orchid buds and fresh fruits, and as such are an agricultural pest. 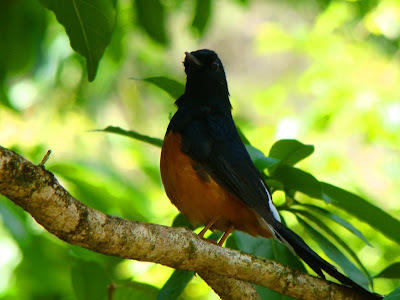 We heard beautiful songbirds in Waimea, and the singers were probably White-Rumped Shamas (Copsychus malabricus), a species of thrush from Malaysia who arrived on Oahu in 1940. They aren't described as pests, but they have penetrated deep into the native forests and probably compete with the native species for food and territory. I had a hard time getting a sharp shot of the adult Shama, but the juvenile came right out in the open for me (below). 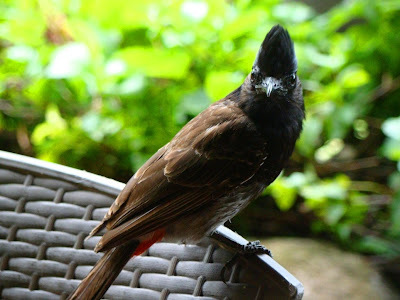 There are three species of cardinals on the islands, including the familiar American version that people see on St. Louis baseball caps. They are one of the most colorful birds that are commonly seen. 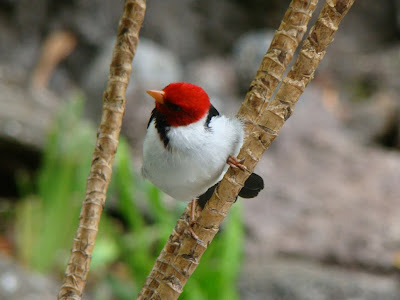 I knew of the Northern Cardinal (the American one), and the Red-Crested Cardinal from Brazil, but I hadn't seen the one below on my previous trips. It doesn't have the crest like the others. 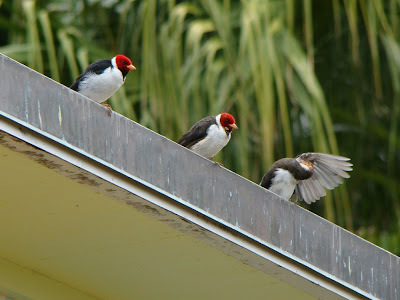 It's called the Yellow-Billed Cardinal (Paroaria capitata), and it is a fairly recent arrival from South America, having first been observed in 1973. It's spreading out from the Kona area on the Big Island. 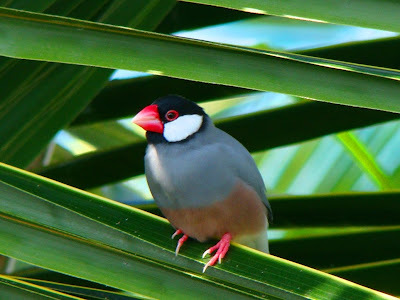 Another colorful pest in urban areas in the Java Sparrow (Padda oryzivora), which arrived from India in 1867. We saw a lot of them in Kona on the Big Island. The one below hung out on our lanai looking for handouts (not this time...). 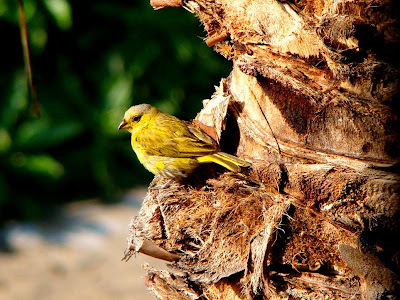 And finally, we have the Saffron Finch (Sicalis flaveola). The one I captured is probably a juvenile, as the adults have a orange blush about the head. They arrived in the 1960's from South America. When you ever make it to the islands, don't hang out in Waikiki! There is so much more to see. 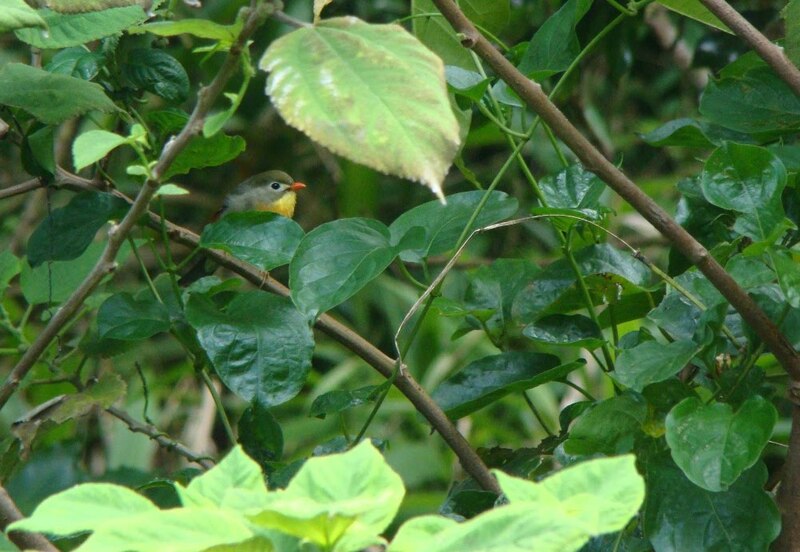 A valuable resource for bird-hunting is the book Hawaii's Birds, published by the Hawaii Audubon Society. It is my best source about the birds, both native and invasive. And since I really am a geologist and not an ornithologist, I am open to corrections on my bird identifications! It's hard to imagine a more spectacular setting than Saddle Road Summit on the Big Island of Hawai'i. Two of the world's largest volcanoes, Mauna Kea and Mauna Loa, overlap at an elevation of almost 7,000 feet. 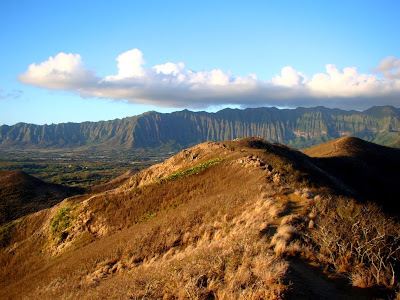 In the middle of the broad pass, with expansive views of both volcanoes, there is one of the most extraordinary sights of all the islands: Pu'u Huluhulu. The name means "shaggy hill". It's a small knob, a minor cinder cone lying between two giants, but it tells a fascinating story. The cinder cone erupted several thousand years ago, and has since been surrounded by barren basalt flows, most recently in the 1930s. 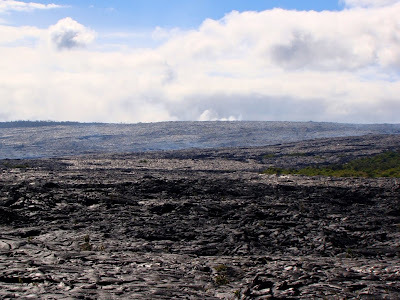 These isolated areas surrounded by fresh lava flows are called kipukas. On islands that have been ravaged by invasive species the way Hawai'i has, kipukas serve as islands within islands. 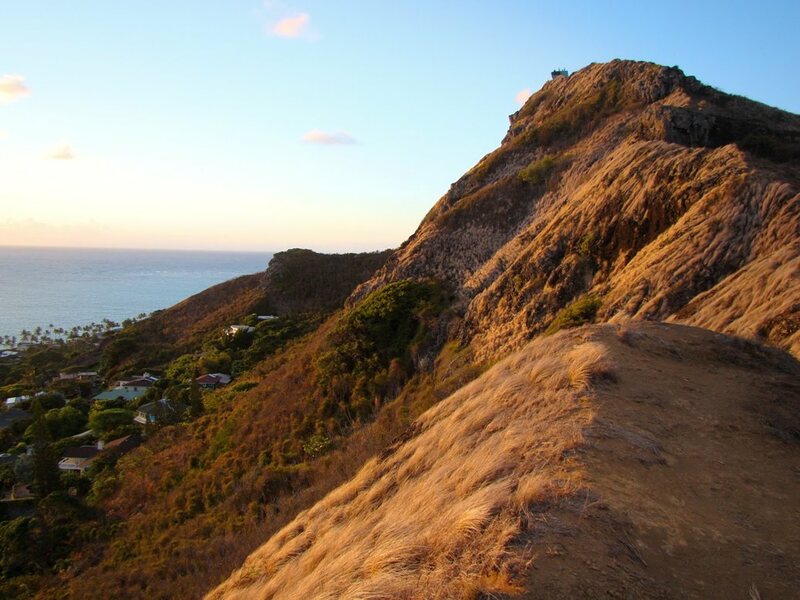 They can preserve a native landscape that has disappeared from most of the rest of the islands. 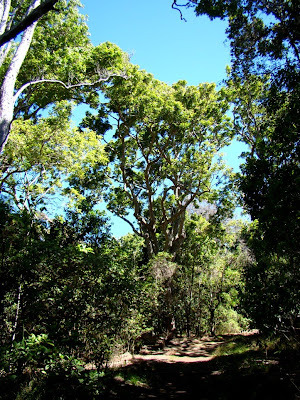 At Pu'u Huluhulu, the slopes preserve a Koa tree forest environment that once covered most of Mauna Kea, but which was decimated by logging and grazing over the last 150 years. If and when we decide to change our land-use practices on the islands, a kipuka like this one can be the source of native species that could eventually lead to the reforestation of the mountains. Koa trees, like those seen above on the trail around Pu'u Huluhulu, once grew in abundance on the islands, reaching upwards of a hundred feet tall, and trunks wide enough to fashion canoes. Most of the "grandfather" trees have been cut down, so a place like this, with a Koa forest environment, is all the more valuable. One cannot mistake this place as a pristine environment, though. 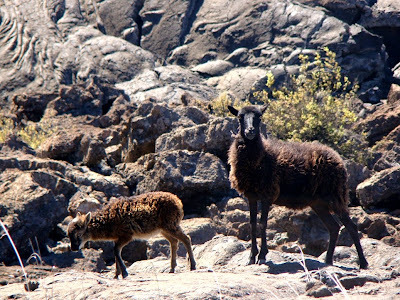 The area was grazed heavily over the years and invasive weeds arrived on boots, and on the fur of goats, cows and pigs. The pigs and goats were especially destructive of the understory shrubs. What has changed is the growing recognition of the value of such places. A fence has been constructed to keep out the goats and pigs, and volunteers have been weeding out the invasive plant species, and planting, or encouraging the growth of dormant seeds of the native understory shrubs and perennials. They're doing a good job. The native vegetation attracts native bird and insect species, and Pu'u Huluhulu is often a good place to see the native Amakihi, Apanane, Io (Hawaiian hawk), Pueo (Hawaiian owl), Nene (the Hawaiian goose), I'iwi and other unique birds. We heard, but didn't see any close enough to photograph on this trip, but I'll be back! 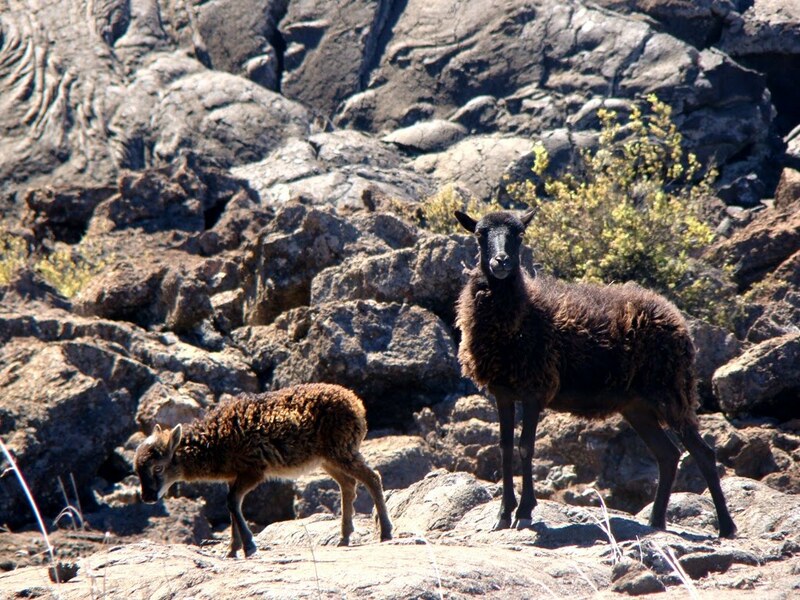 We did see a rather incongruous sight, though: a herd of goats wandering across the barren lava fields (that's the "kao" of the blog title today). They know very well what lies across the fence, and they literally hang around the gateways in the fencing, hoping for a chance to get into the kipuka and do their thing, which is eating and eating. When they say "close the gates", please do it! There is grazing land across the highway for the goats. 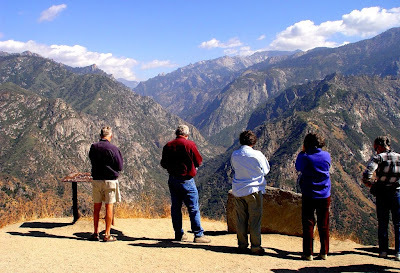 If you have old memories of Saddle Road as a hellish, dangerous winding mountain road, or if you visit for the first time and read that the road is not for the faint of heart, the situation (for better or worse in the philosophical sense) has changed. The road has been repaved and engineered, and is a pleasant drive, if it isn't raining or foggy. Some people miss the wildness of the old route, which was pretty unnerving when I followed it for the first time. 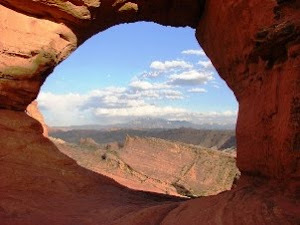 The expansive views, especially on the western slope on clear days, are stunning. It's a purely Hawaiian experience, but not a Hawai'i stereotype. There really isn't any place like this in the world. If I seem to have been missing in action, well, no, I was missing in inaction. After the lava adventures at Kilauea a few days ago, I went north and west on the Big Island seeking serenity and peace, and the green flash. 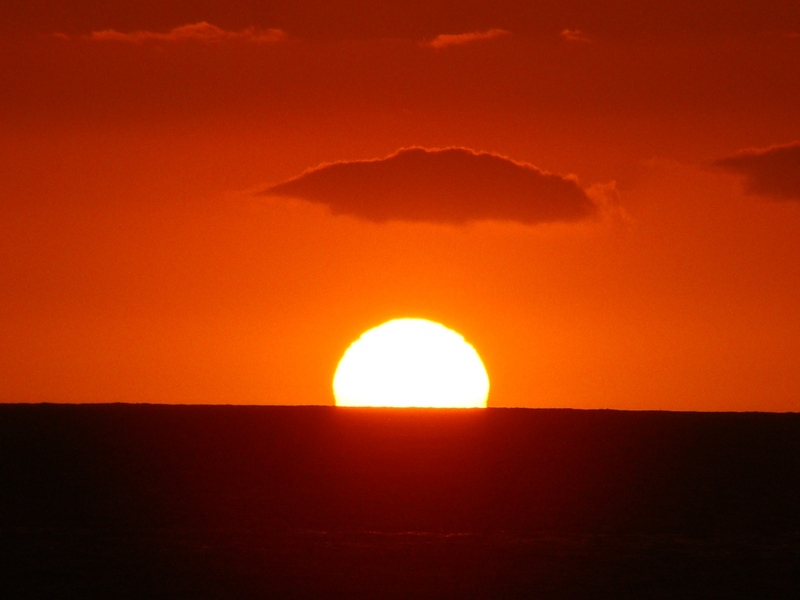 Catching the green flash is not the pathway to serenity though, because something will go inevitably wrong, and there will be curses flung. It is beautiful out here. I will have a few pictures up soon; my internet access has been spotty (well, no, not really, I was just ignoring it...). Here is a gratuitous flower shot from a tropical woodland called the Cloud Forest. There is a road that shoots straight up Hualalai volcano from Kona, climbing from sea level to 5,000 feet in a really short distance (better appreciated when trying to drive back down without burning out the brakes). The temperature went from 83 degrees to 57 degrees on the climb. I really had no idea what to expect. Pu'u o'o vent on the east rift zone of Kilauea on the Big Island of Hawai'i has been putting out vast amounts of lava for most of the last 27 years, and day to day the location of the flows can change. For months at a time the active flows can remain high on the palis, far from any trailhead, and other times the lava can flow almost entirely through tubes, emerging for only a few seconds at the coastline before being consumed by waves. Unfortunately the flows can suddenly break out in new directions, leading to destruction of homes, roads and sacred archaeological sites. 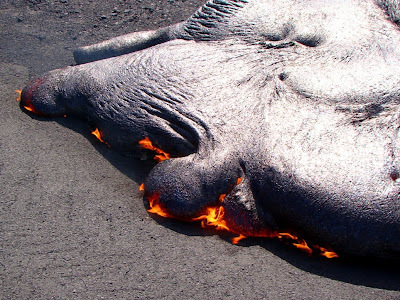 Scheduling a trip hoping to see active lava flows is always a crapshoot, and I have learned not to expect great conditions. Sometimes it just isn't gonna happen. My trip to the Big Island this week was no exception. Over the last few weeks the volcano goddess Pele has been unusually active, and a huge flow threatened homes in what remains of Kalapana (most of the town was overrun by lava in 1990). One home was destroyed, and lava came within a hundred feet or so of several other houses. Such spectacles bring spectators, and there have been complaints from property owners of tourists (and tourons) crossing property lines and leaving messes. The county responded by establishing a viewing area, but the view is often limited. 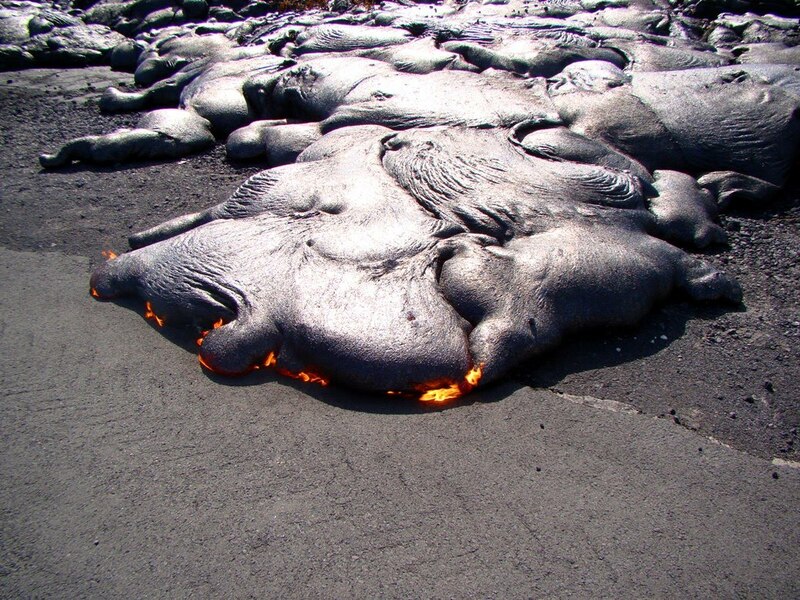 I was one of those tourists who showed up, and I respect the needs of the homeowners, but the desire to see active lava is a powerful impulse in a geologist. So I arrived at road's end not knowing what to expect. Sometimes the stars line up just right, and sometimes there is the small print. I arrived at the viewing area early in the day, and just a few people were walking down the road. 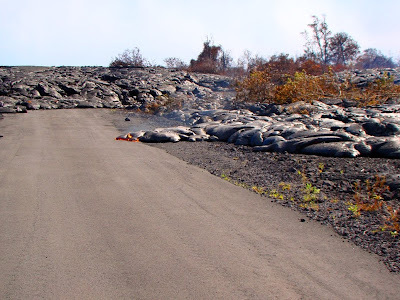 The lava was mostly at a distance, but I had read of a new breakout near the end of the road, and when I arrived, I was given a very brief chance to cross the lines and check out the leading edge of the flow just as it started to consume some of the old highway. The deal was that I move back behind the lines when someone else showed, and that lasted all of 90 seconds. I didn't complain. It was enough to stand four feet away from the blazing hot rock and snap off a few photographs. Enjoy! Even had I not seen the lava up close, the other sights were fascinating. Above, on the pali, I could see the pathway of the lavas as a wall of steam and smoke along the tubing system that was bring the lava from the vent at Pu'u o'o six or seven miles away.Visitors at night would see the glow of incandescent lavas on the slopes. 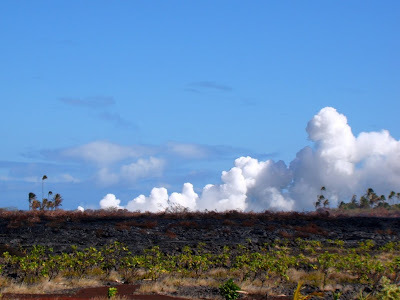 Towards the coast, I could see the steam rising from where the lava was pouring into the sea (this ocean entry was saving homes in Kalapana by draining lava away from the village). At night the steam will glow orange. That's fresh lava from the last week in the foreground; the brown plants were burned by the passage of the flow. 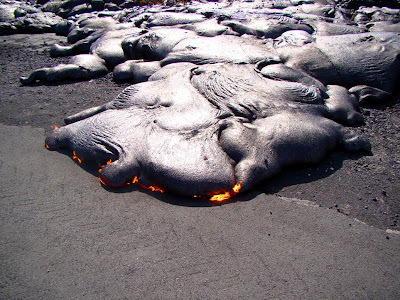 Lest we forget, there are actually two areas where volcanism is occurring on the Kilauea shield. In 2008, a vent opened in Halemaumau below the park visitor center and laboratories, and lava has been simmering in a 600 foot deep hole ever since, with the occasional explosive outburst. The shot above is how it appeared this morning. It was a great day! My pictures hardly do justice to the lava, by the way. To see some great photography and get some on-site descriptions from someone who lives there, check out Leigh's sight, Hawaiian Lava Daily. 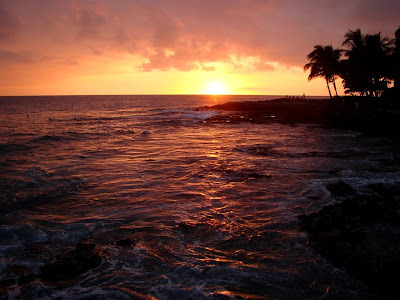 I've always been partial to the Hawaiian Islands that aren't Oahu. I suppose I'm just being snobbish in a geologic way because I feel a visit to the islands is just wasted if all you see is Diamond Head and Waikiki (which is what a great many tourists do). If you want to see a city, well, there are lots of cities all over the world. But there are only a few good-sized Hawaiian Islands. 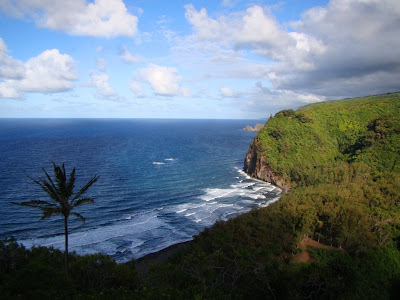 And the scenery on Kaua'i or the Big Island has always seemed to outdo Oahu, to me at least. But then again, I fool myself into discounting the treasure beneath my feet. The other day I watched the sun rise from Kaiwa Ridge on the Windward coast of Oahu, and had a geological awakening at the same time. The hike is short, just 4/10ths of a mile, but the climb is 600 feet, and I was seriously huffing and puffing most of the way up the small mountain ridge. My destination was the "Pillbox", a machine-gun emplacement built during World War II. When Pearl Harbor was attacked on Dec. 7, 1941, it was actually the northeast shore near Kailua that was hit first. The concrete structures were soon constructed to defend against a feared Japanese invasion that luckily never came. As I struggled up the steep trail, I found myself imagining the poor Army grunts who had to haul ammunition up these hills. The view from the top was astounding. I could see the most of the Ko'olau Range, which forms the steep cliffs that surround Kailua and Kane'ohe, as far as Kane'ohe Bay. Hidden in the rocks of these impressive 2,000 foot cliffs was an incredibly violent story that probably affected the entire Pacific Ocean basin. 2.7 million years ago, the Ko'olau volcano was a massive shield complex, much like Mauna Loa or Kilauea today on the Big Island. To the south, the volcano was buttressed against Oahu's other volcano, but to the north there was only deep ocean. A huge caldera, about eight miles long and four miles wide formed the volcanoe's summit. Around two million years ago, the north flank of the volcano destabilized and slipped into the sea, forming an underwater landslide of apocalyptic proportions. The huge mass, called the Nu'unau Slide, flowed underwater for a distance of 120 miles. A single chunk in the mass is eighteen miles long and a mile thick. A slide this large almost surely produced a super-sized tsunami that would have caused serious damage across the Pacific Rim. Needless to say, we wouldn't want it to happen today. 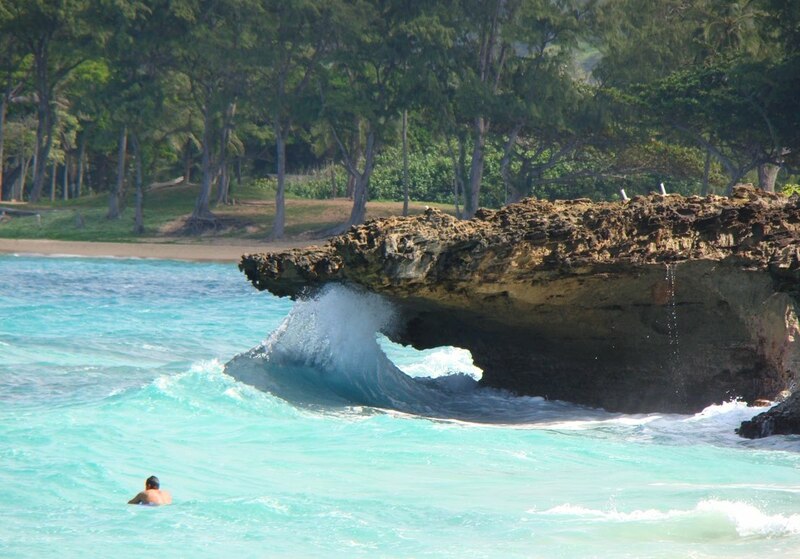 Such waves have landed chunks of coral more than a thousand feet above sea level on the islands. 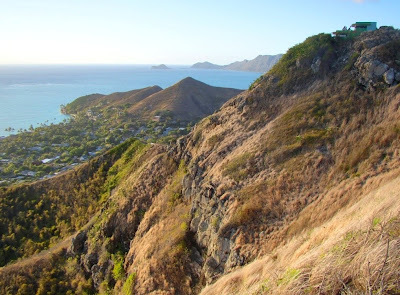 Kaiwa Ridge, the one I hiked the other morning, is made up of dikes and altered basalts of the caldera. The steep cliff in the distance, the Ko'olau Mountains, is the rim of the massive landslide that wreaked havoc across the Pacific. It is on the eroded remnants of this geologic catastrophe that the peaceful village of Kailua is built. Now this is what I call a vacation! 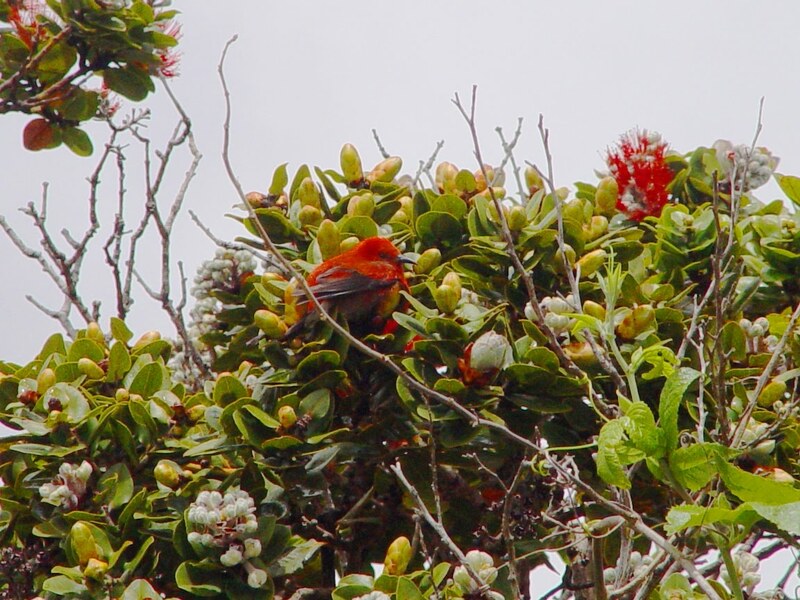 One of the joys of visiting the Hawaiian Islands are the chances to see the unique birds. Although residents may get used to seeing the Myna birds and Zebra Doves, almost every bird in sight is unique to me, the mainlander from California. Not only are the birds unusual and colorful, they represent one of the best ways to see evolution and natural selection in process. The islands are one of the most isolated landmasses on the planet, and prior to the arrival of humans they played host to a diverse group of island castaways and survivors (birds who arrived by accident, and colonized the new volcanic islands). Single species of birds found a range of food sources, and adaptations soon appeared in different populations. Eventually a group of finches called honeycreepers evolved into more than fifteen distinct species. Darwin would perhaps have found them more compelling than the finches of the Galapagos. Many dozens of other unique bird species can be found here (and many more, found as fossils only, are extinct). I "collect" birds when I am on the islands (on digital imagery, of course), and I get excited whenever I "capture" a new one. 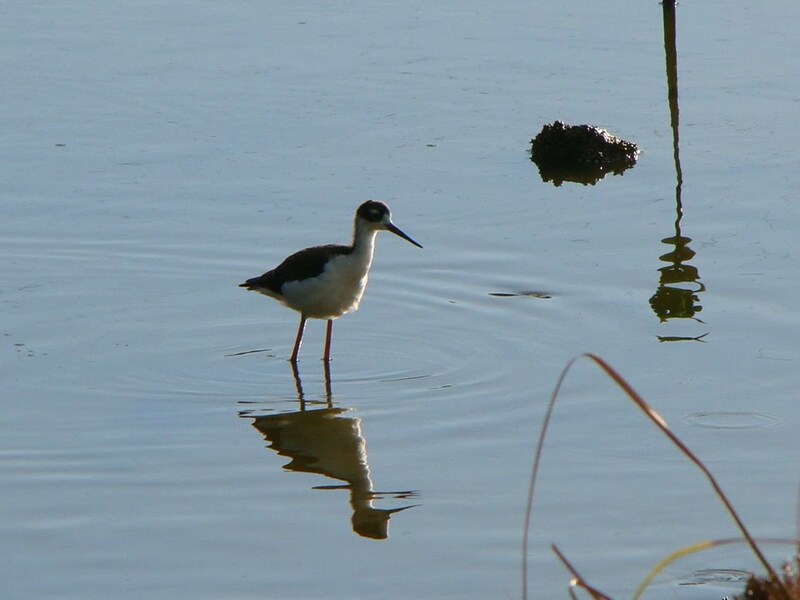 The picture above is my first half-decent shot of an Ae'o, the Hawaiian Black-Necked Stilt. They are related to stilts on the North American continent, but show distinct differences. It is endangered, with only about 1,300 of them on the islands. They have been quite shy in my previous encounters, but a zoom lens is a wonderful thing. 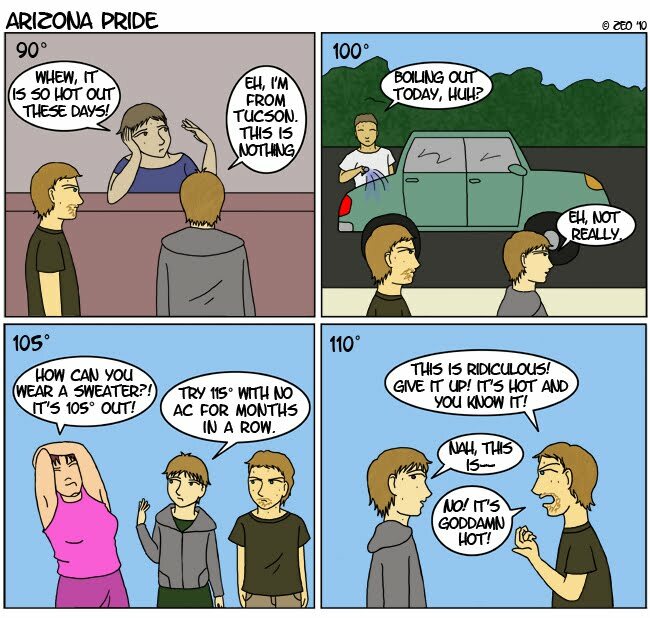 Natural selection is acting in the present day as well. Animals adapt to changes in their environment, and few changes are more drastic than the arrival of humans. The ancient Polynesians brought new animals to the islands 1,500 years ago, and the bird species who could not compete with the new arrivals disappeared. The survivors will eventually adapt to the new invaders. The process of competition accelerated in the 1800's and 1900's as ever more birds arrived with humans. Escaped pet birds, and misguided attempts at pest control resulted in most of the native birds being driven into refuges high in the forested mountains. 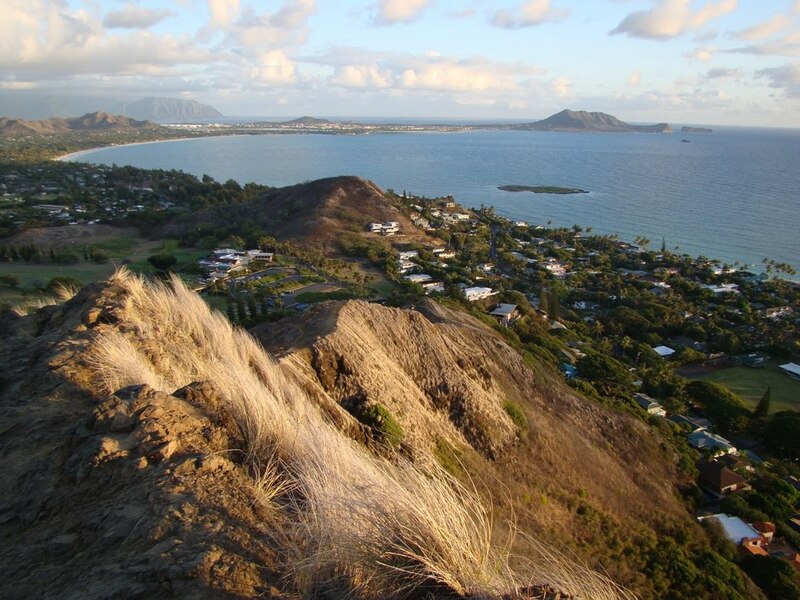 Most visitors, especially the ones who stay only on Oahu, never see the native species. The Mynas are Indian, and the Zebra Doves are Australian. Just the same, some of the introduced species are very pretty, and I saw a new one yesterday on the cliffs at the Pali Overlook above Kailua. The old highway is now a trail being reclaimed by the jungle. We heard a lot of birds singing, and for a split second, the singer appeared just long to get two fuzzy photographs. The beautiful yellow and red bird turned out to be a Red-Billed Leiothrix, a 1918 Chinese import. 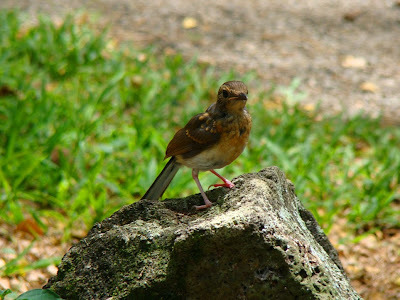 It is also called a Peking Nightingale. It lives in dense forests and is said to be hard to spot sometimes, despite the bright colors. If you ever get the chance to come out to the islands, get away from the cities! It is a precious and beautiful place to explore, from the shoreline to the tops of the highest volcanoes.